The map, at left, is a scan from the last brochure produced by the sanctuary. 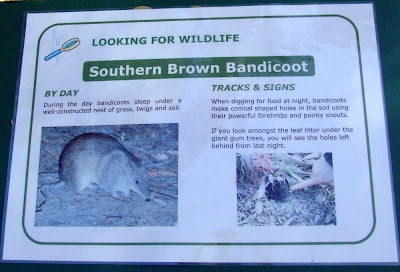 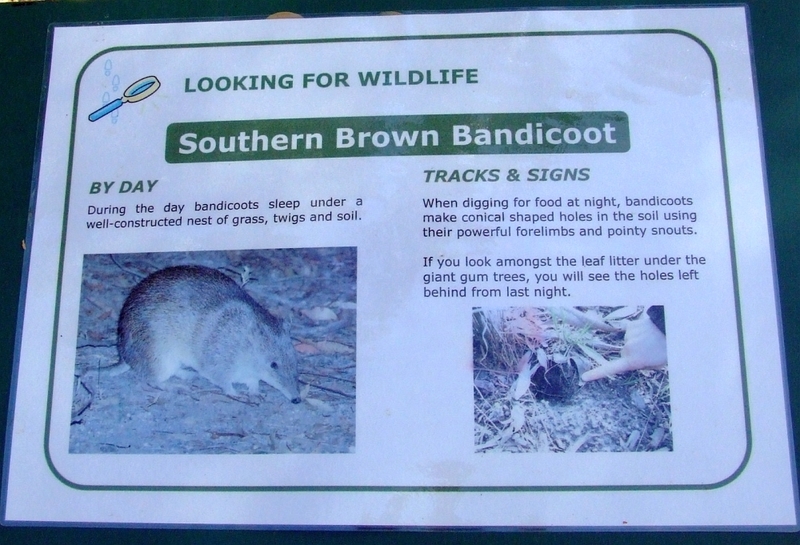 The Bilby Cafe is at bottom left, and the hike takes us clockwise around the whole property, via the grass lands, the swamp, the lake, the rainforest, tall forest, the ruin (marked with the red icon) and the scrub lands. 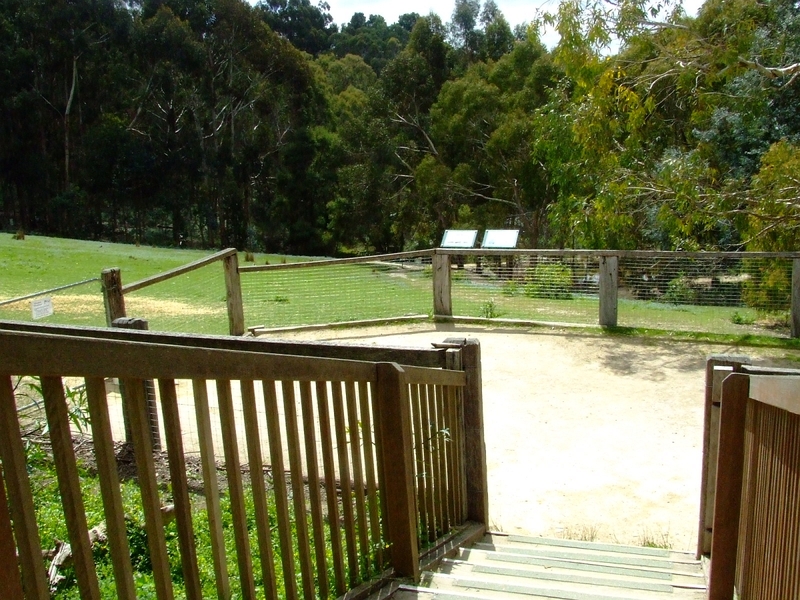 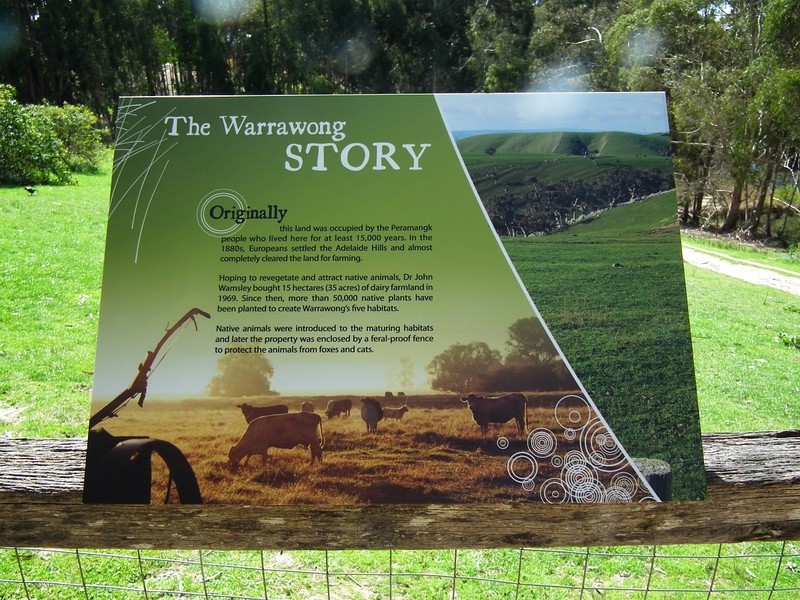 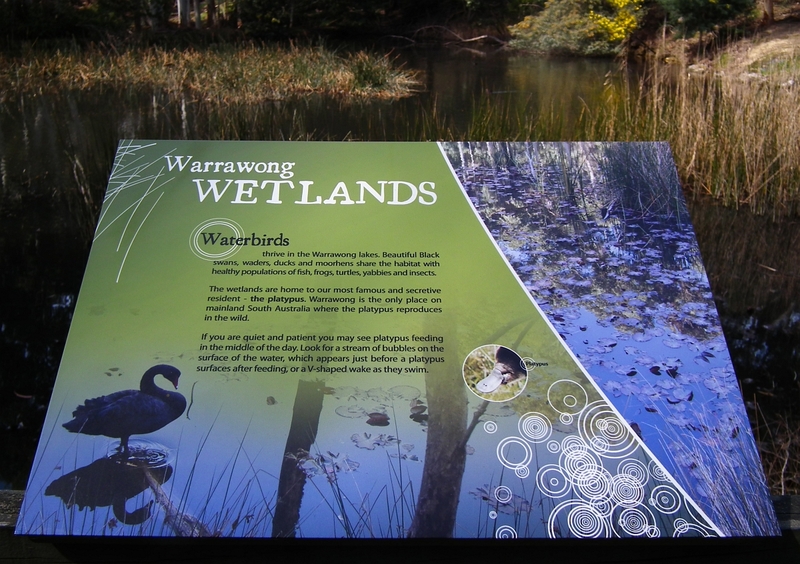 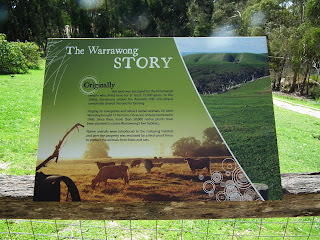 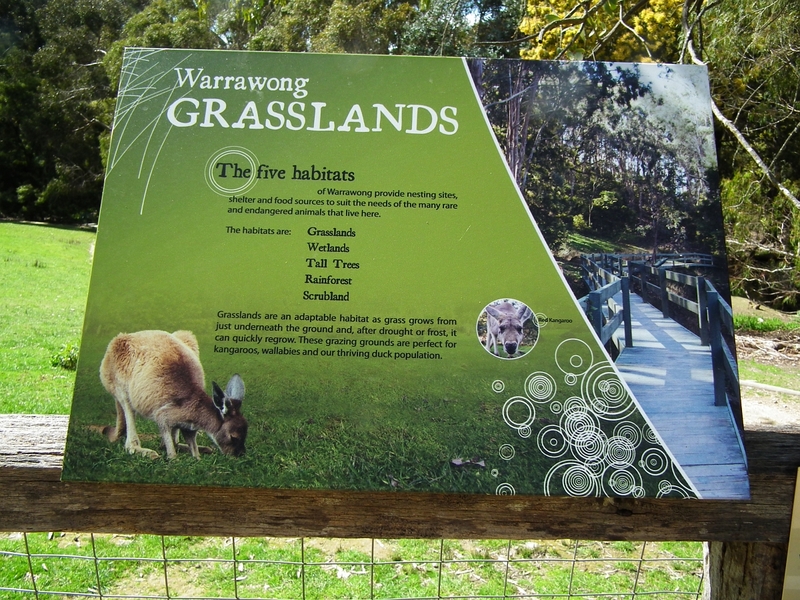 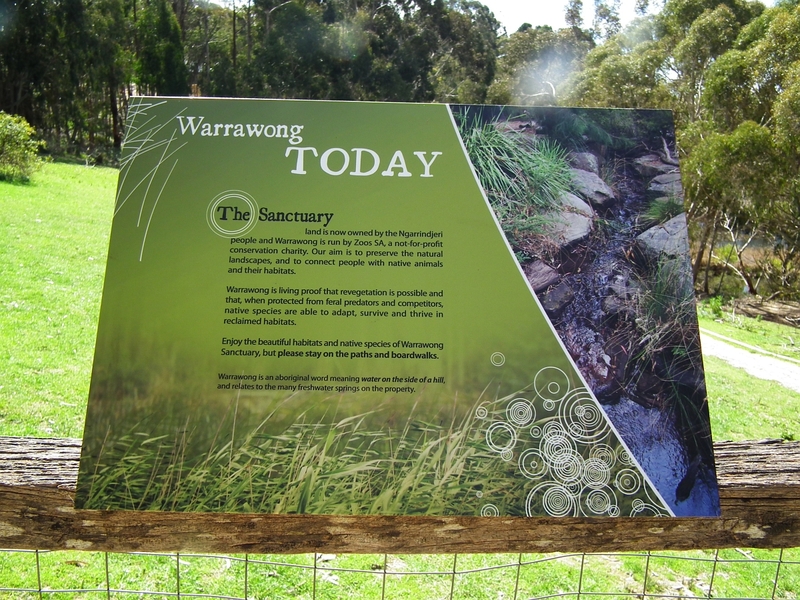 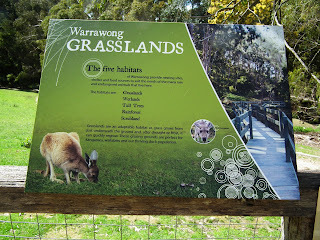 Before you leave the deck, take a moment to actually read the information boards that tell the story of Warrawong, and give you a little info about the grass lands area you're about to hike. 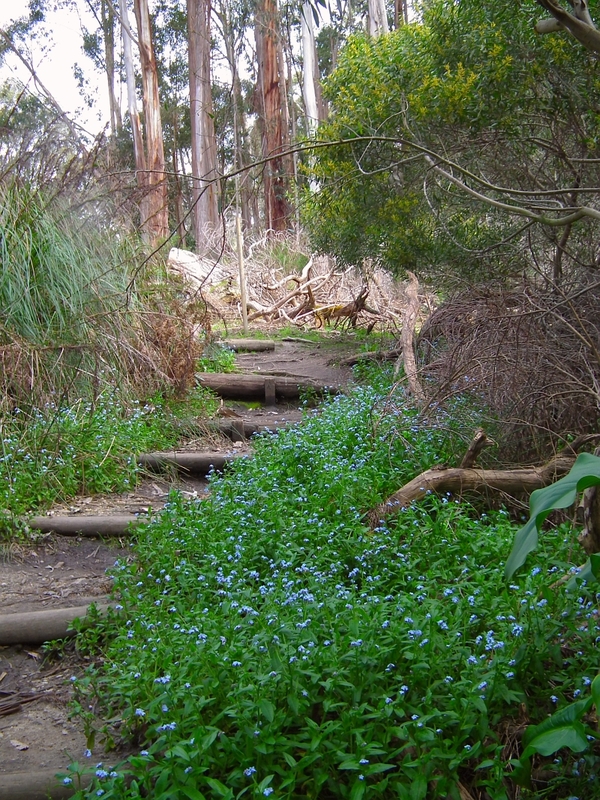 Down the steps: see the grass lands immediately below. "Raindrops keep falling on my lens..." This visit, it rained! 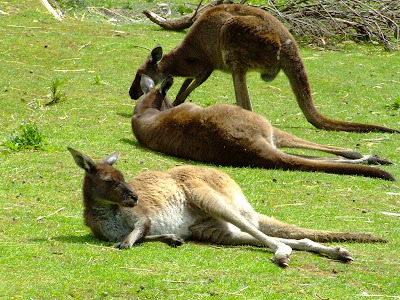 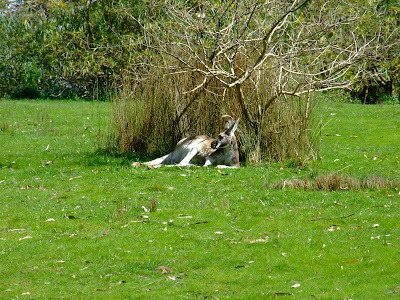 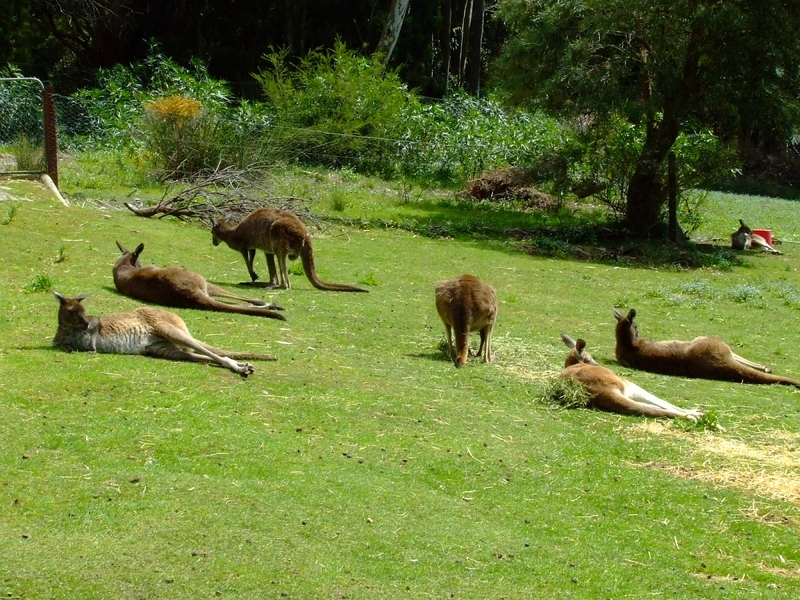 A roo lives the good life at Warrawong. 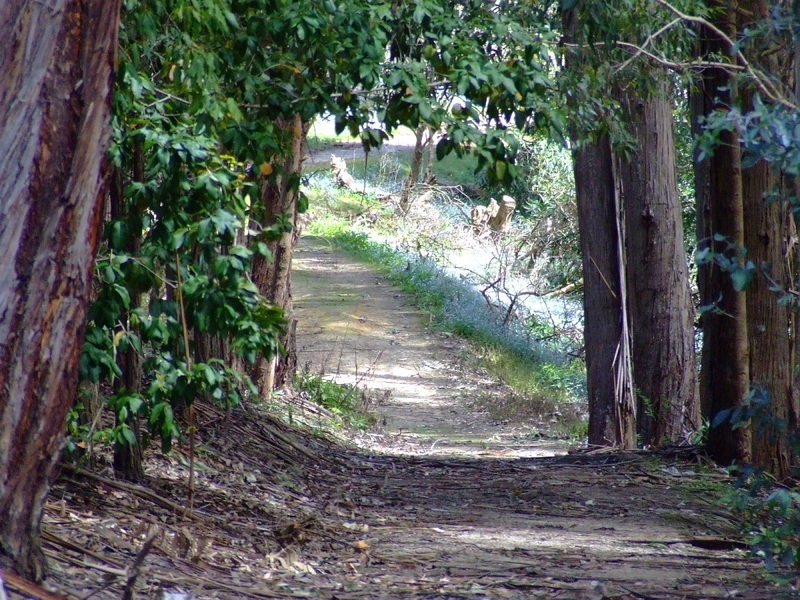 As you leave the grass lands, you're heading down to the lowest point on the property -- the swamp. 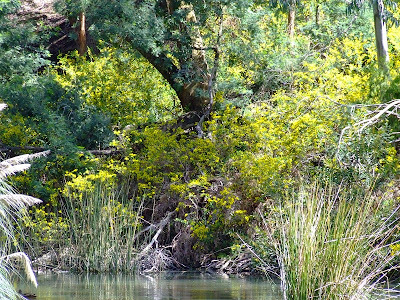 It's planted in with reeds and water lilies ... you'd expect to see swamp hens, all manner of ducks, black swans, and this is the only place on mainland south australia where platypus nest! Look back -- look up -- at the Bilby Cafe and reception center. 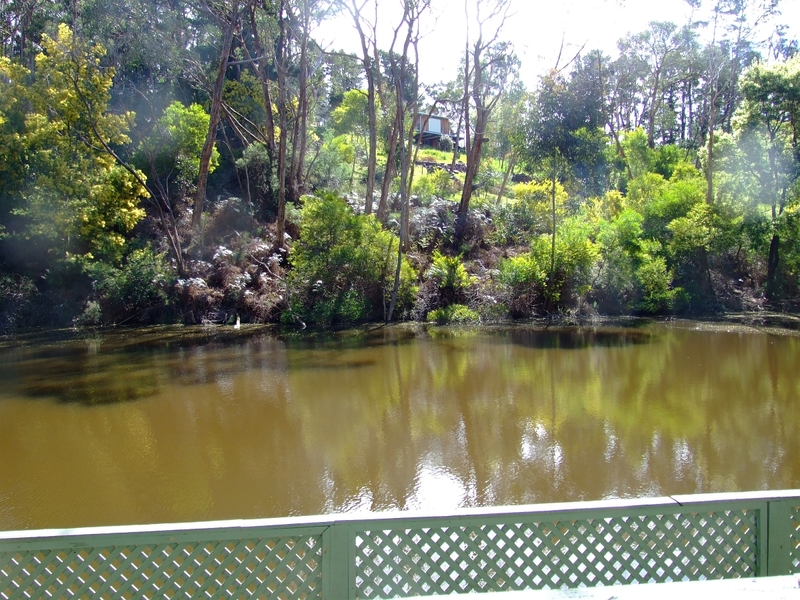 ...with the big lake at the bottom of the hill. 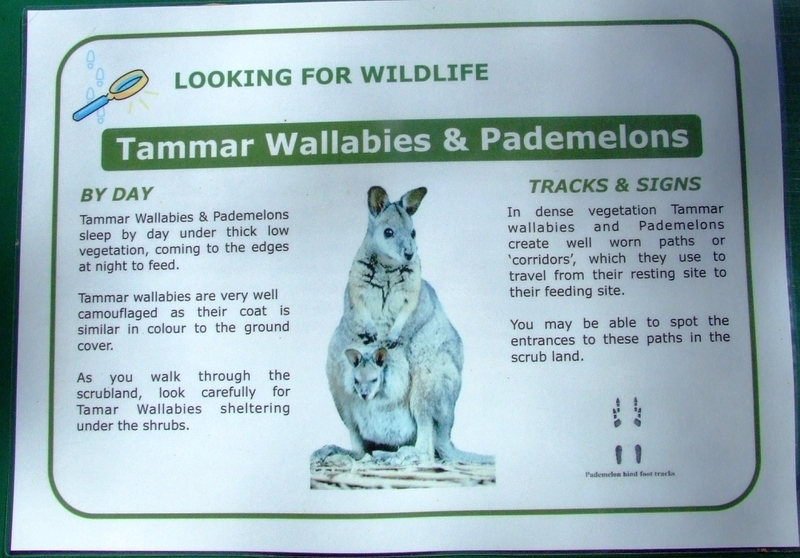 Take a moment to read the information board. 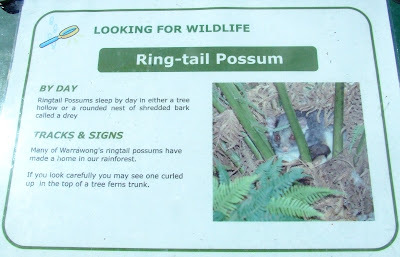 Platypus, too! 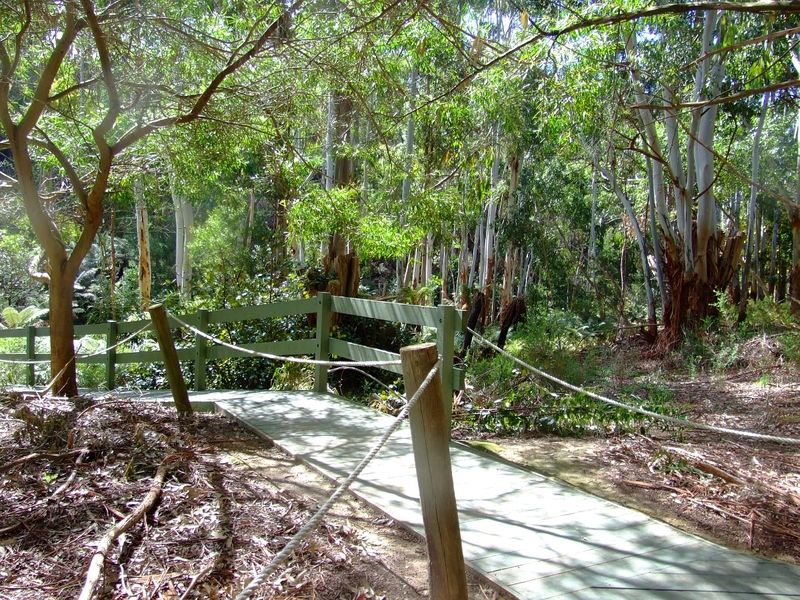 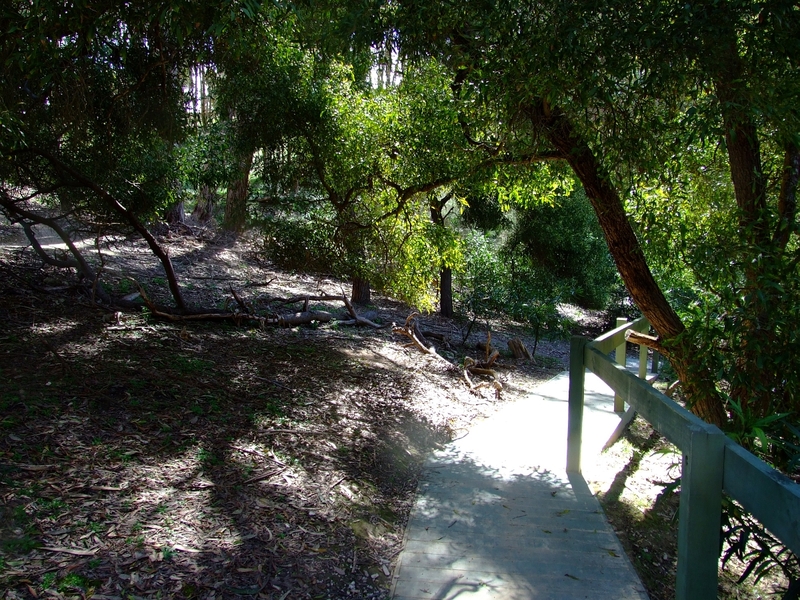 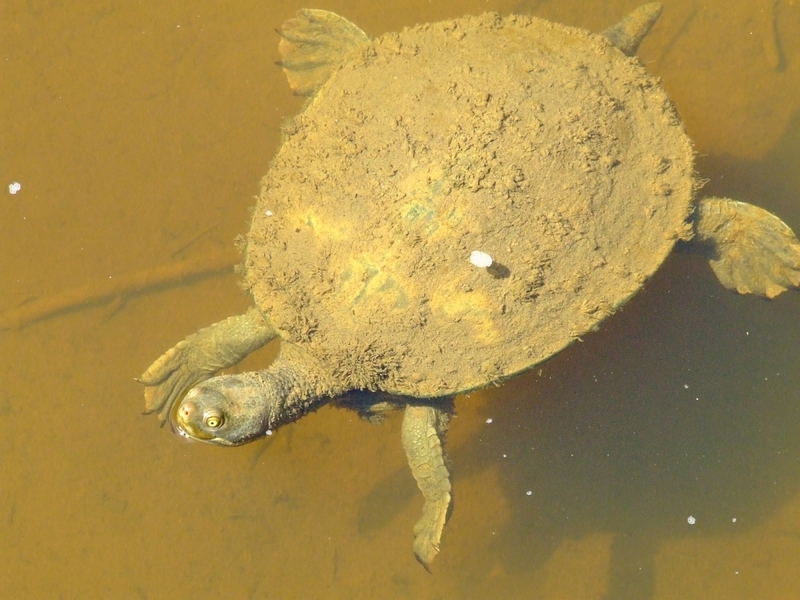 From the wetlands, you'll follow the trails and boardwalks to your left. 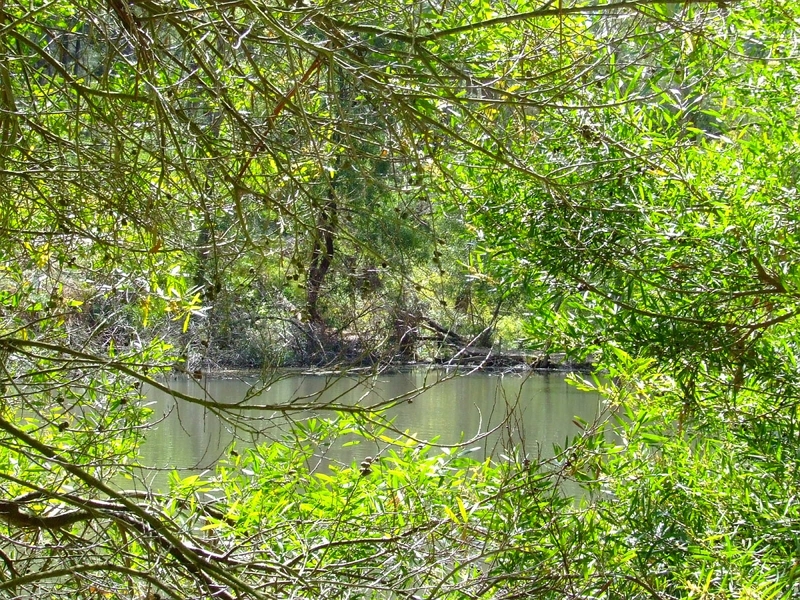 As you leave behind the swamp, you're headed for the wooded lake, known as Black Lake. 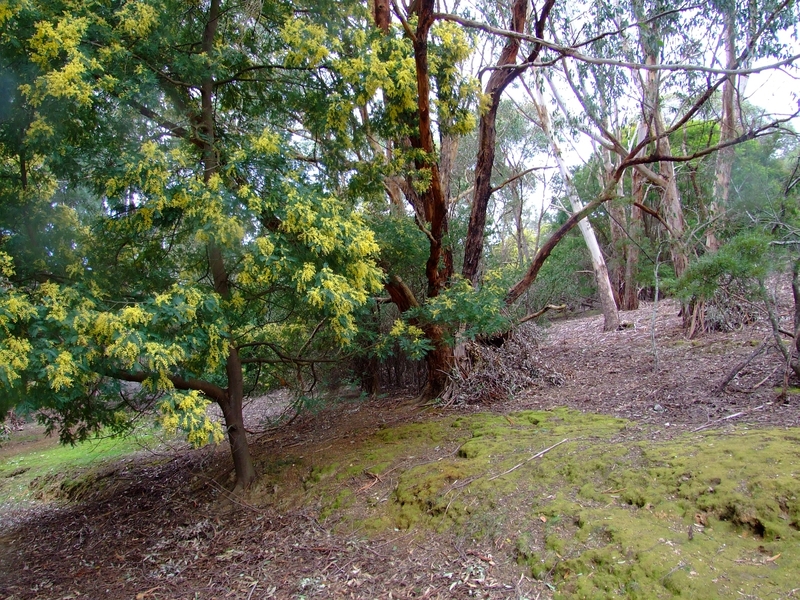 It's a riot of flowering native shrubs, in season, and you can see geese, koalas, bandicoots, as well as some Very Tall Trees! Black Lake, from the boardwalk. 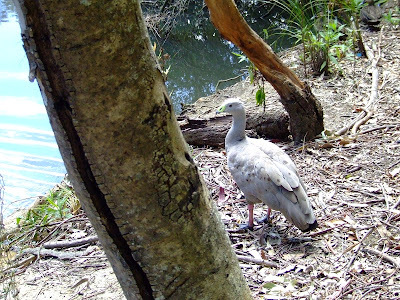 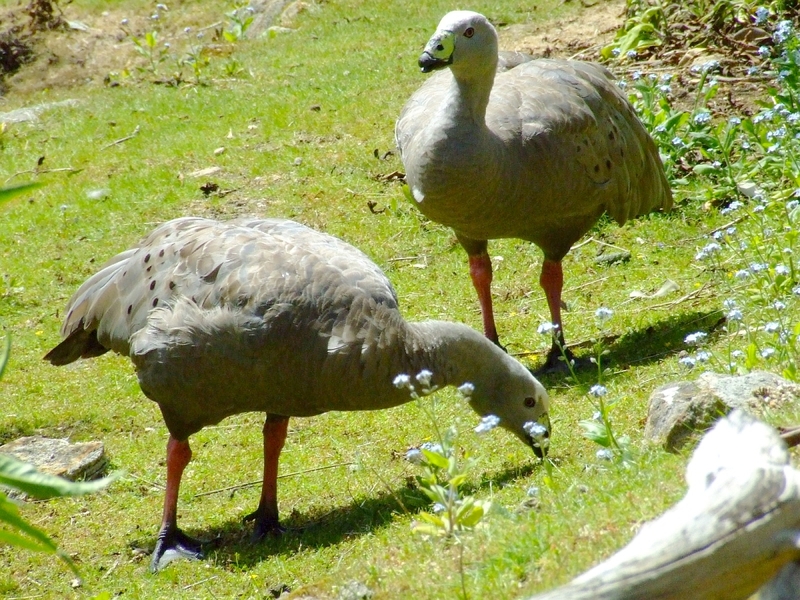 Cape Barren geese at Warrawong. 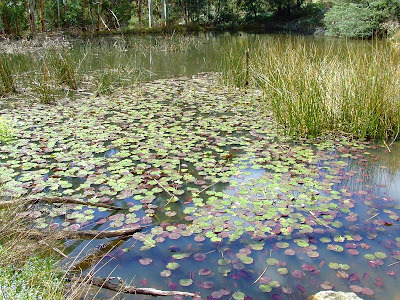 Black Lake in springtime ... ker-chooo! 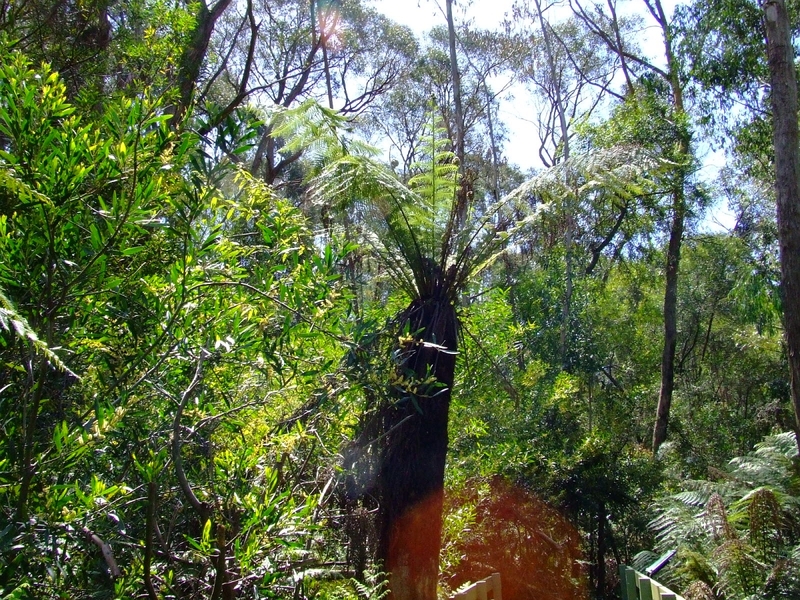 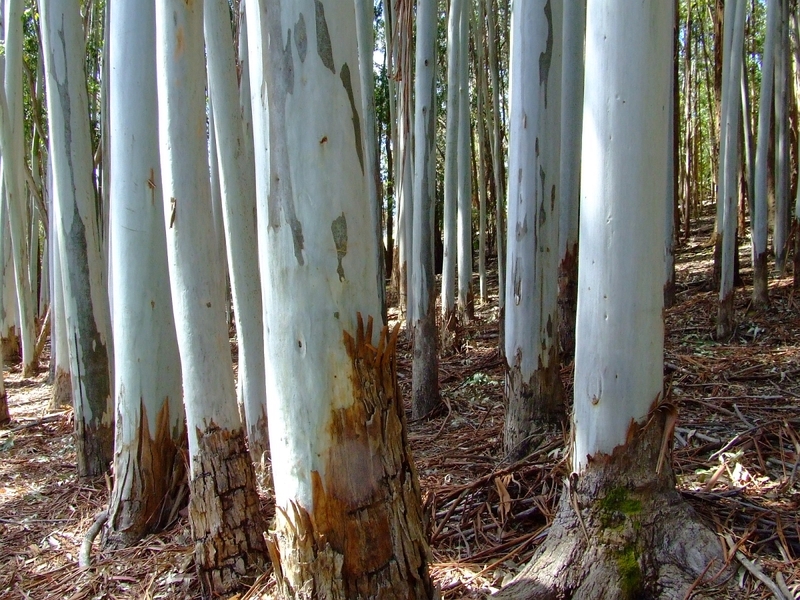 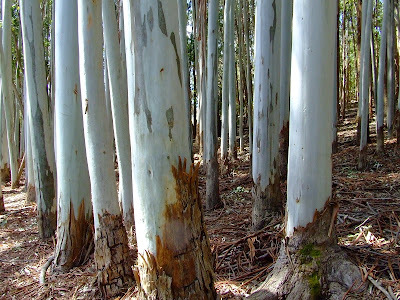 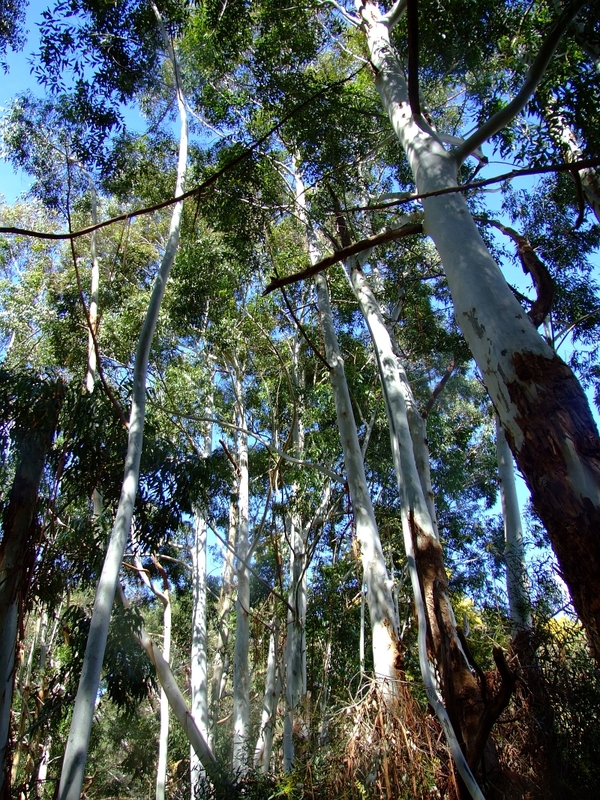 The tall trees region. 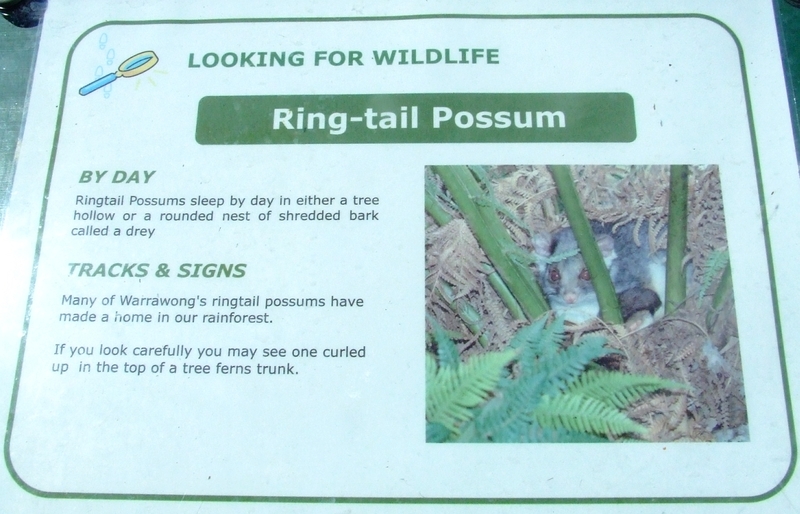 Watch out for koalas. 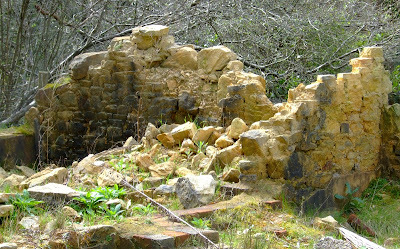 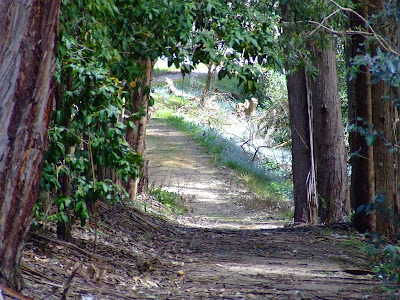 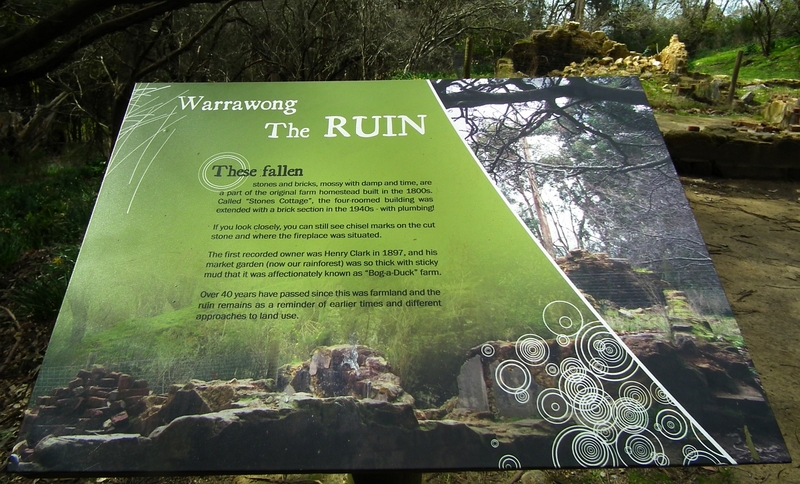 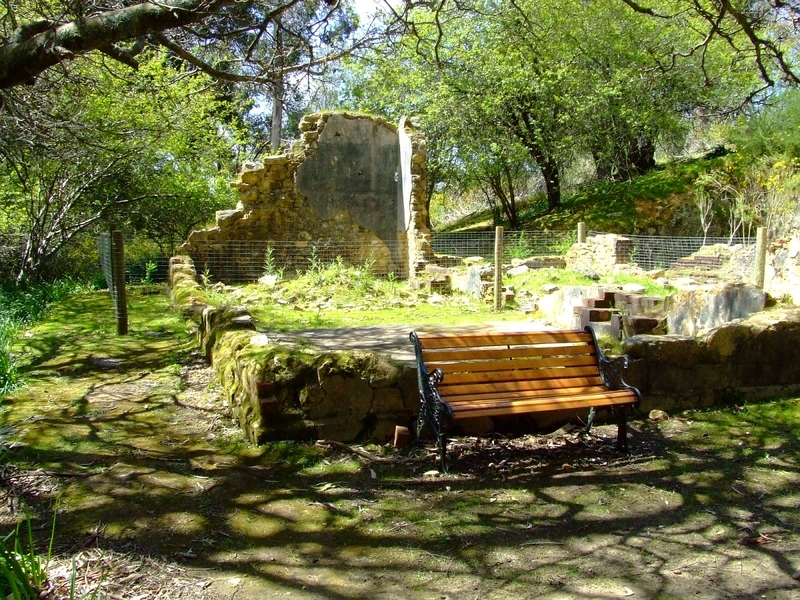 It's marked on the Warrawong map as "the ruin..."
Follow the trail right back to the Bilby Cafe. Tea, anyone --? 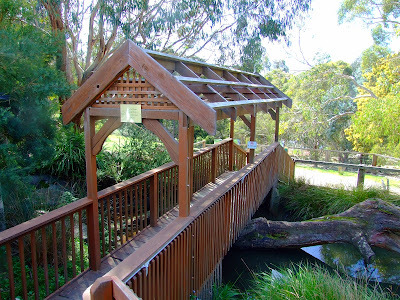 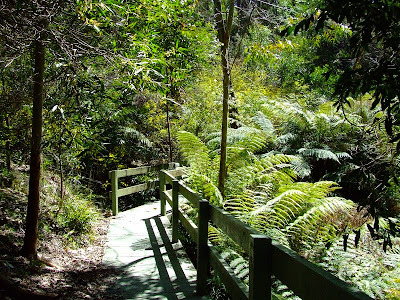 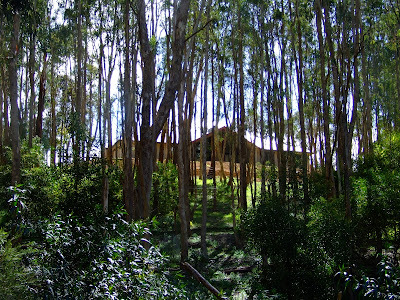 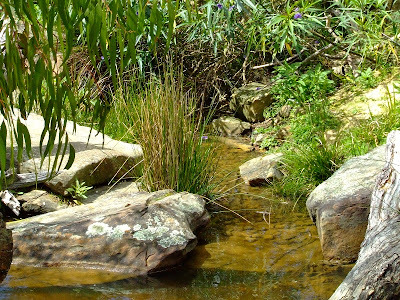 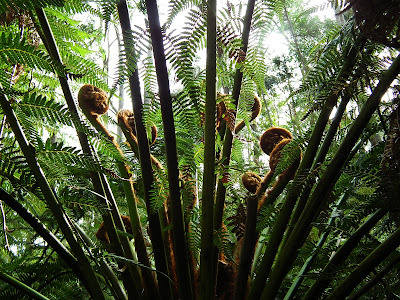 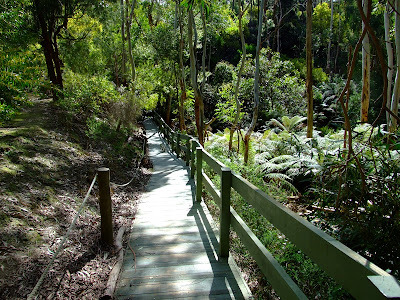 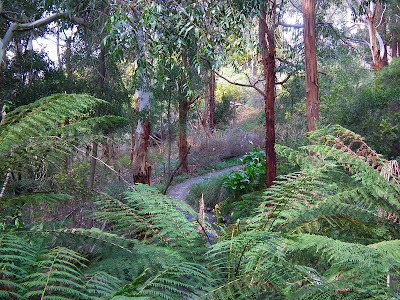 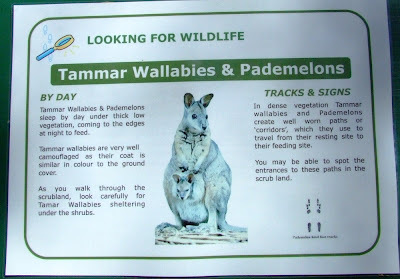 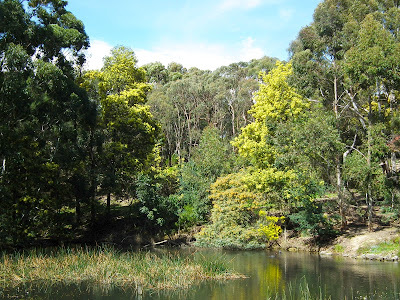 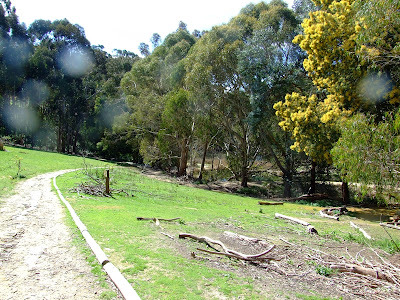 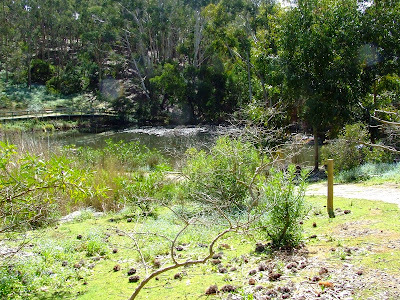 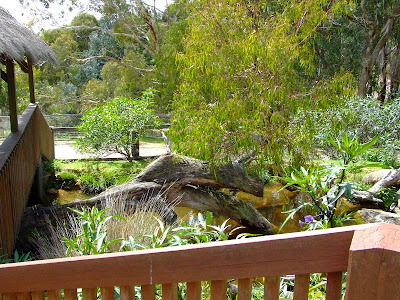 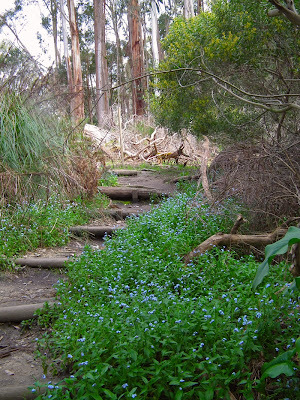 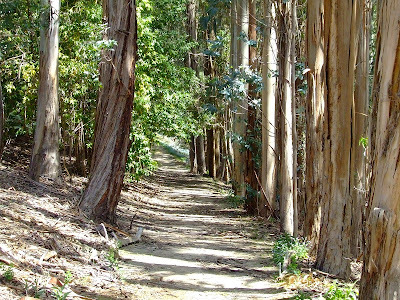 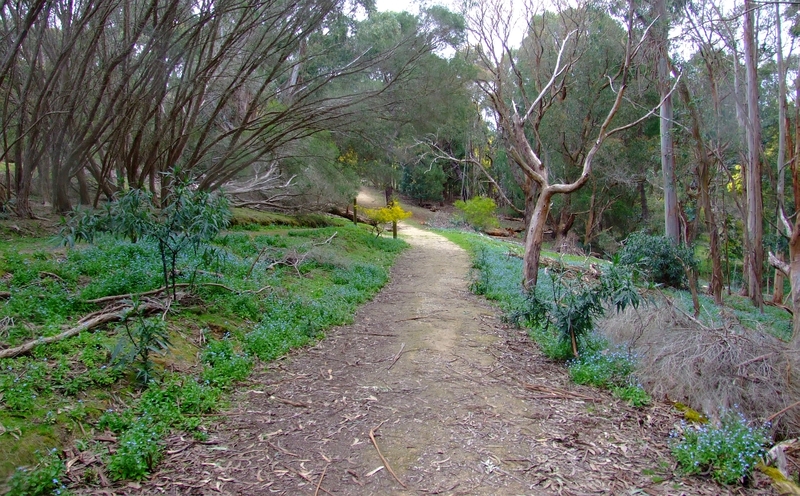 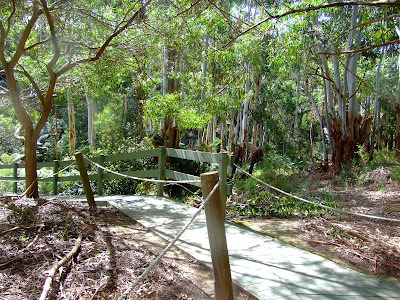 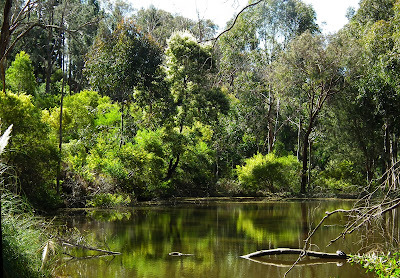 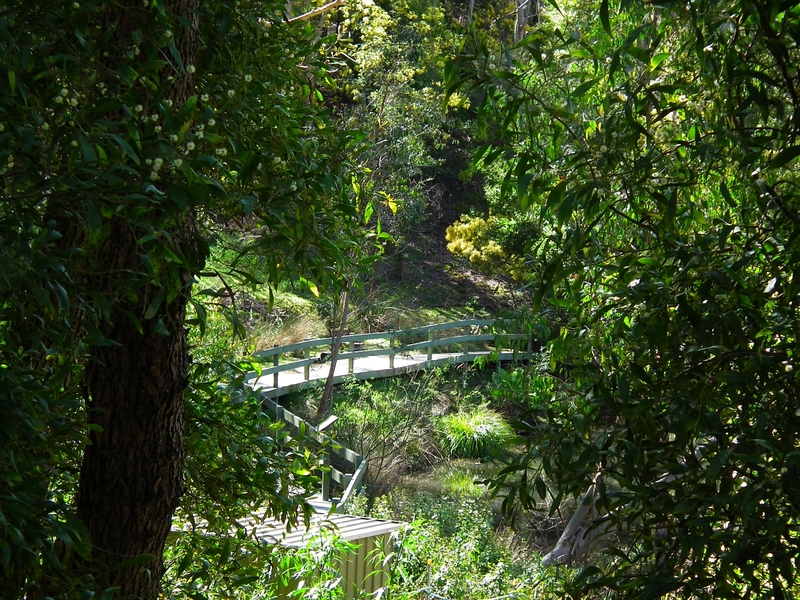 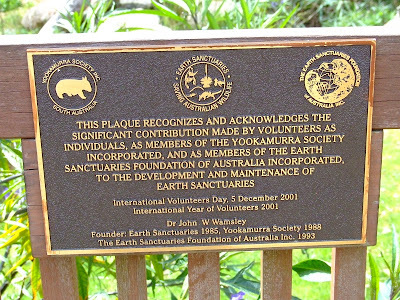 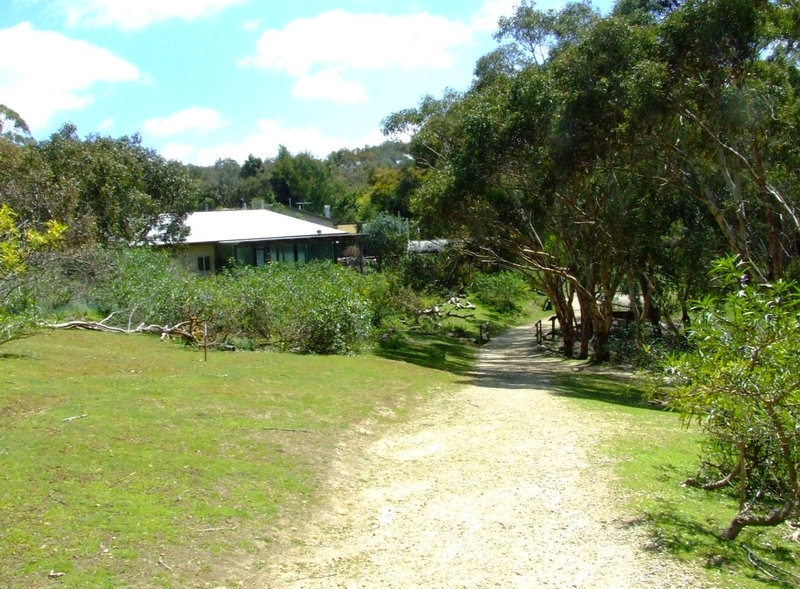 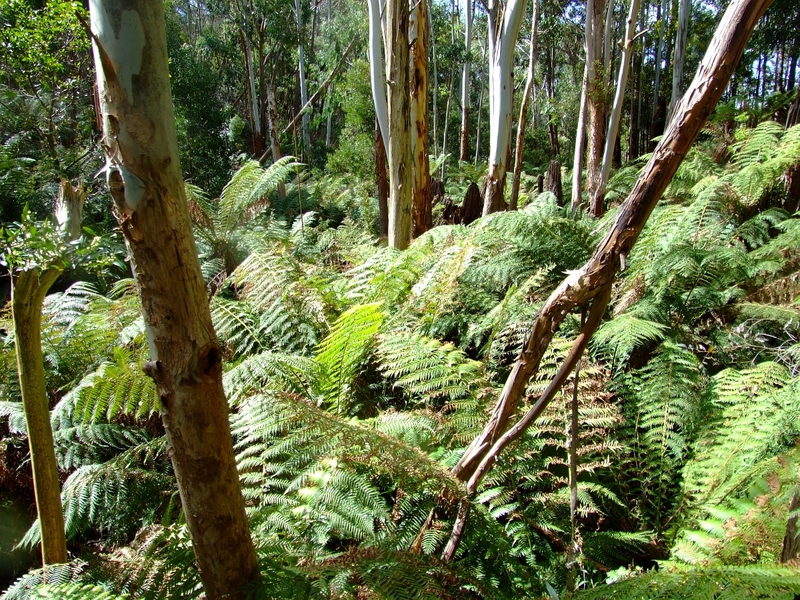 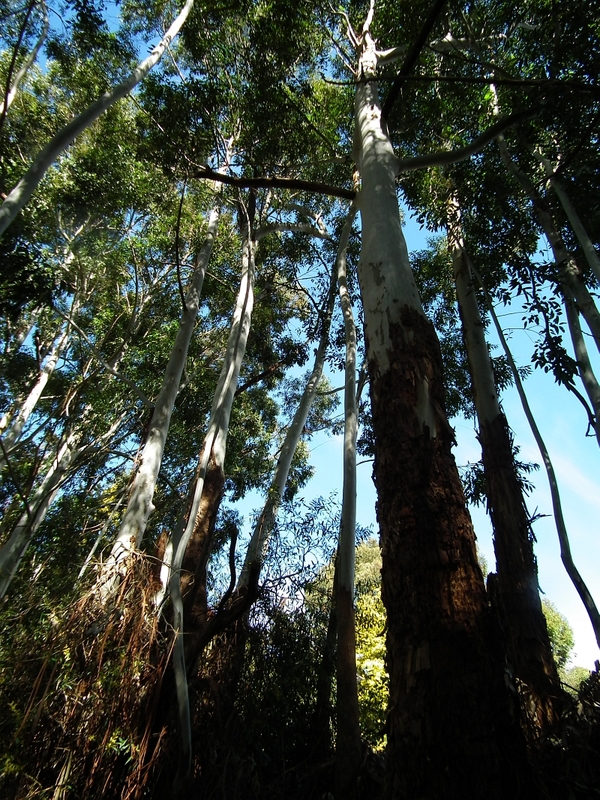 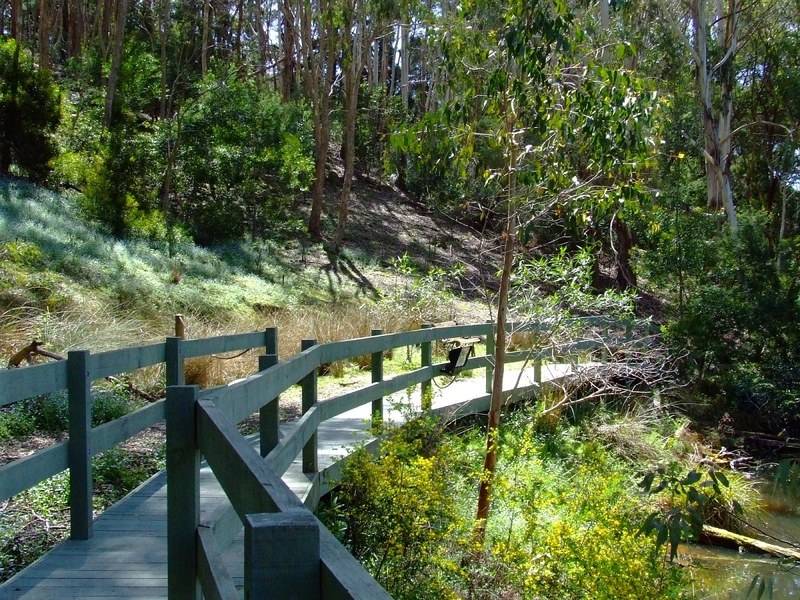 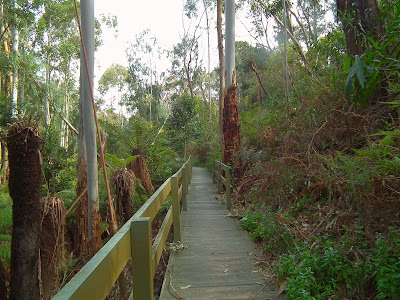 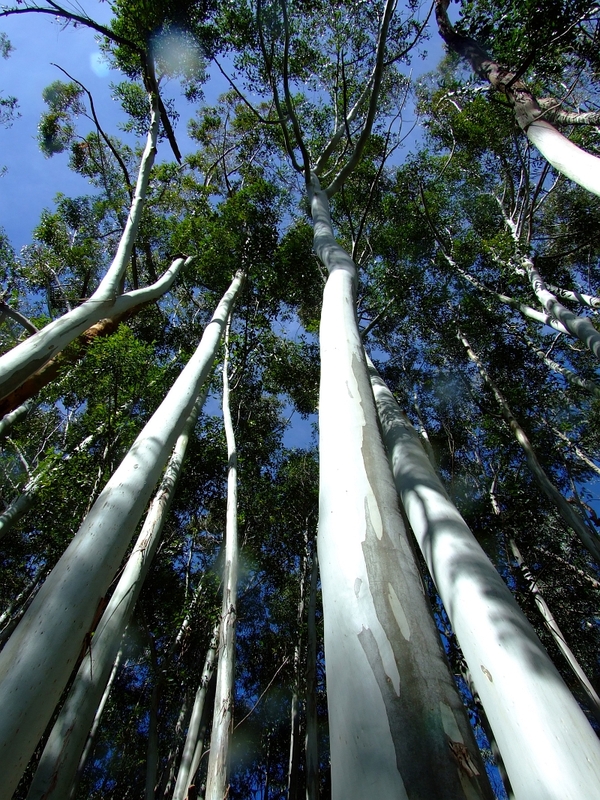 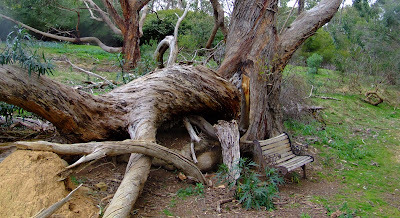 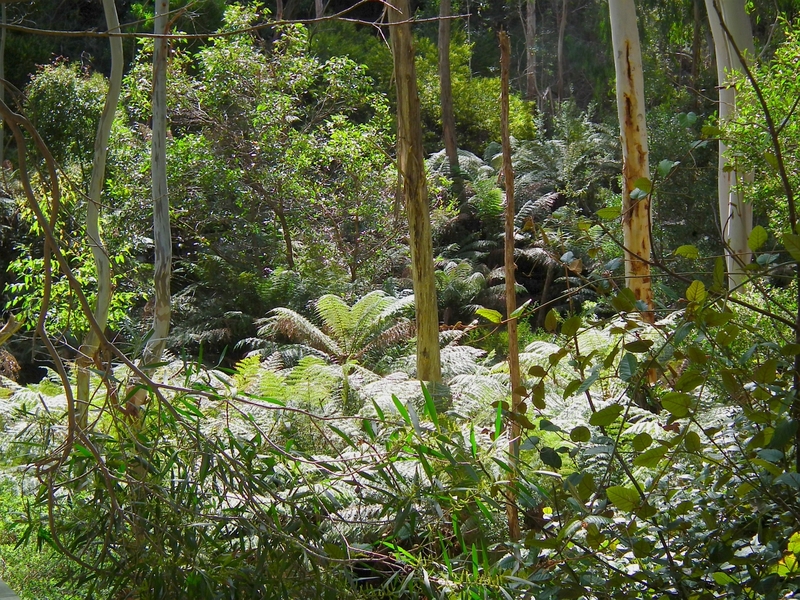 For years, Warrawong Sanctuary was one of our favorite places in the Adelaide Hills. 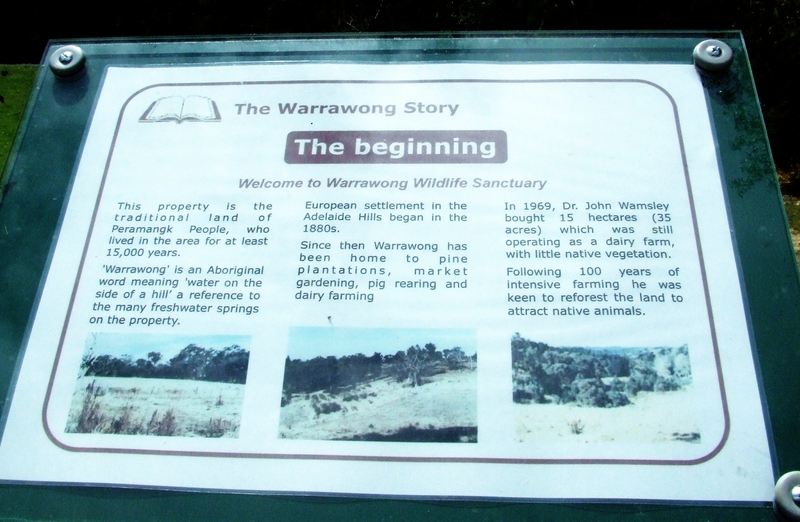 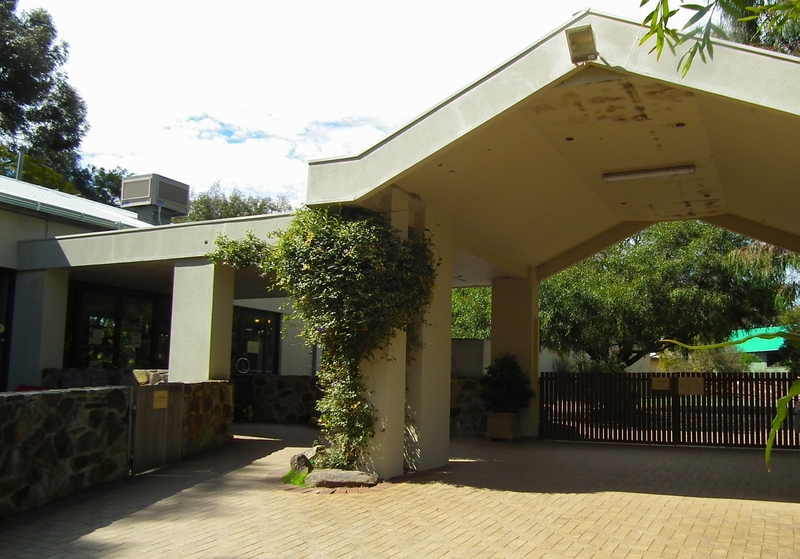 We were so sad to learn that it was closing (see the reasons in the first part of this two-part feature), and ... here is our "Farewell to Warrawong," which we'll probably come back to often as visitors to our own blog, to jog the memory. 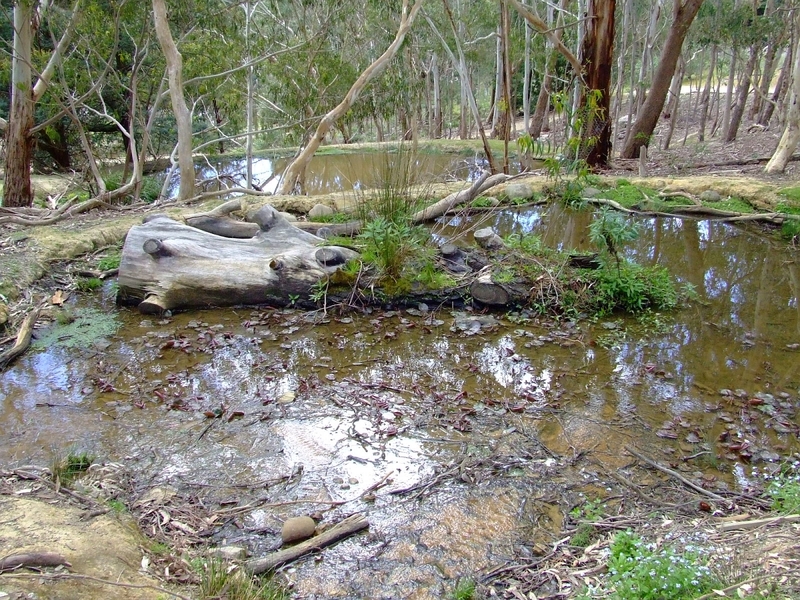 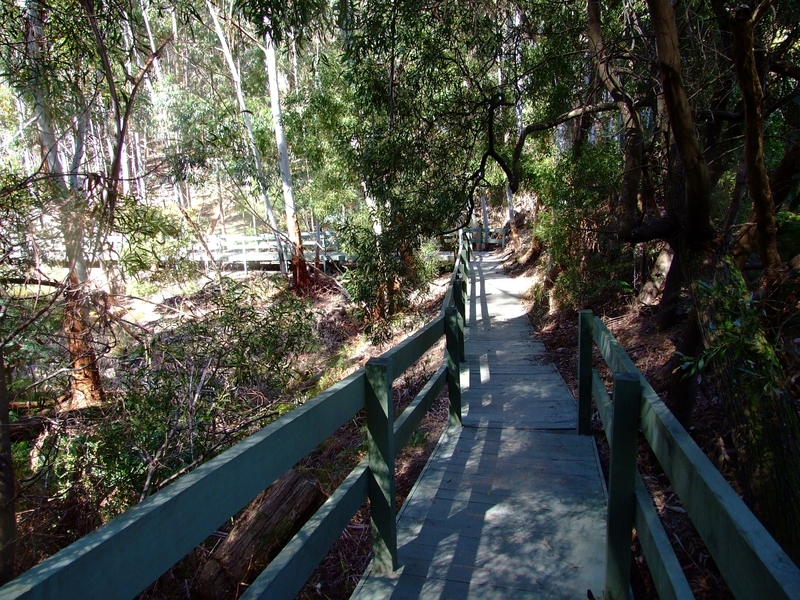 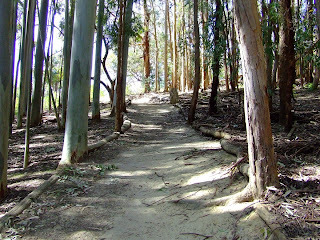 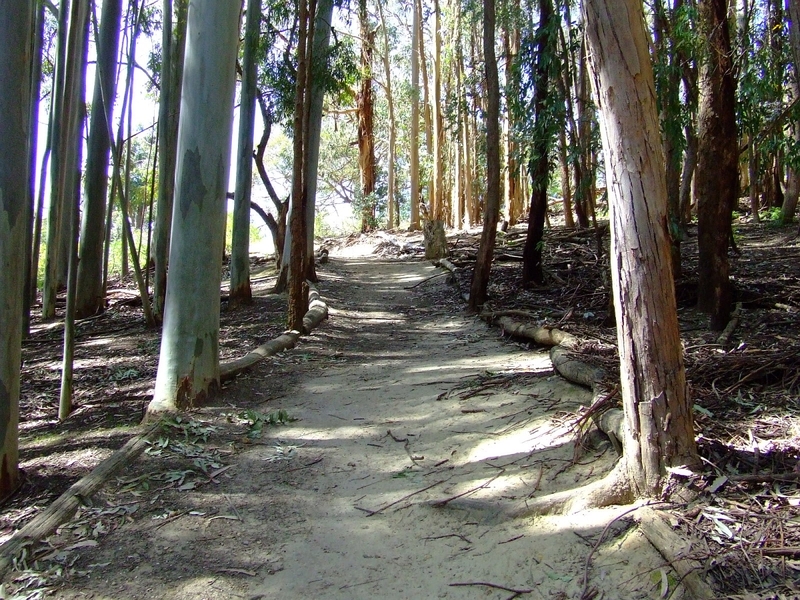 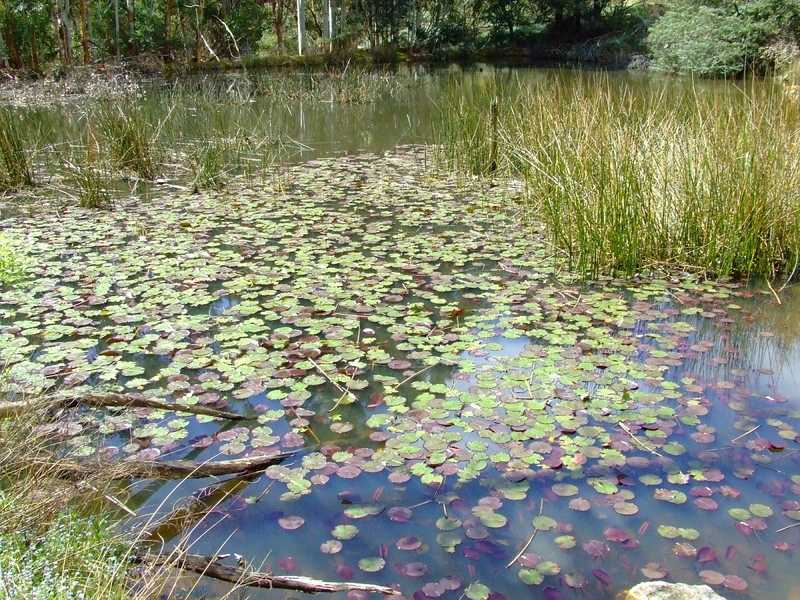 The images were captured in all seasons, in all weathers, but there was one constant: Warrawong Sanctuary was beautiful, tranquil, and unique.